Hastings resident LaVern B. Muhleisen, 98, passed away Tuesday, October 9, 2018 at Perkins Pavilion Good Samaritan Society-Hastings Village, Hastings, NE. Services are 10:30 a.m. Friday, October 19, at Faith Lutheran Church in Hastings with Pastor Paul Dunbar officiating. Burial with military rites by Blue Hill American Legion is 1 p.m. Friday at Trinity Lutheran Cemetery in Blue Hill. In lieu of flowers, memorials may be given to Faith Lutheran Church, AL Shirley Post, or Mary Lanning Hospice. Visitation is 9 a.m. - 7 p.m. with family present 5-7 p.m. Thursday at the funeral home, and one hour prior to service at the church. LaVern was born June 3, 1920, on a farm near Ayr, NE to Louis & Emelia (Flessner) Muhleisen. He married Madalynn Maxine Bock on June 21, 1941; she preceded him in death on October 21, 2015. LaVern farmed in the area for many years. 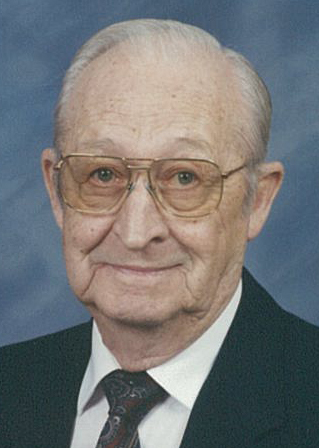 He was a member of Trinity Lutheran Church in Blue Hill, Faith Lutheran Church, American Legion, and AL Shirley Post. LaVern was preceded in death by his parents; wife, Madalynn Maxine Muhleisen; brothers, Clarence and Ardene; and great-granddaughter, Korri Duffield.